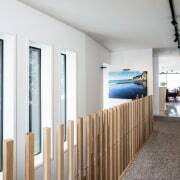 ​​​​​​​A fence depicting Mt Taranaki provides an excellent clue to the location of this home by Boon Team Architects. 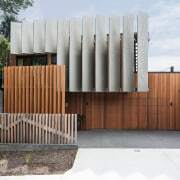 The architectural fins and slats on the street facade provide privacy for internal rooms and match the orientation of the picket fence and cedar cladding. Some homes look like they’ve simply beenplonked on a site while others feel like they’re a direct response to their surroundings. 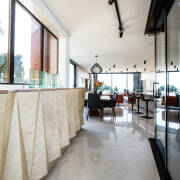 Right from the street, you know that this New Plymouth home – designed by architect Murali Bhaskar of Boon Team Architects – is all about engaging with its setting. The picket fence includes a graphic of Mount Taranaki while the facade’s large architectural fins are etched with topographical lines of the area. In terms of functionality, the home had to make a street statement and include four bedrooms, an office, laundry, a four-car garage, a guest bathroom, four outdoor living spaces, an outdoor fire, spa pool and even a roof deck. 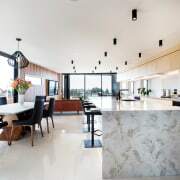 ​​​​​​​A run of sculptural plywood storage cabinetry provides visual interest on the way to this home’s open-plan living-dining-kitchen space. The deck that noses in between the living area and master bedroom is directly to the right. 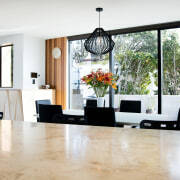 Concrete floors with a pebble aggregate contribute to the relaxed coastal feel required by the owners and help draw the large space together. 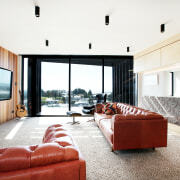 Black window joinery provides contrast to the pale interiors and helps frame the views. 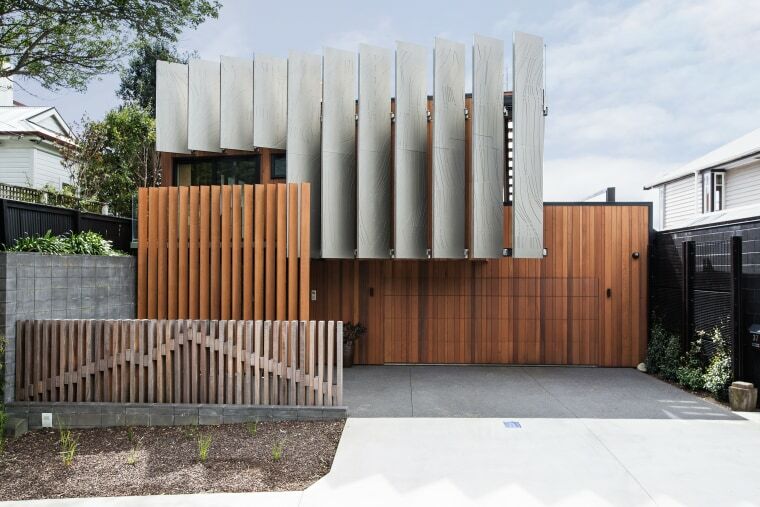 Seen together, the fins, fence and timber cladding on the wall and garage door reflect a strong vertical emphasis, giving the dramatic street presence required. However, the front of the home maintains privacy and offers little hint of the expansive interiors and views to come. The entry hall leads straight ahead to the ground-floor bedrooms with their own shared deck. 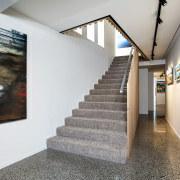 However, visitors climb the stairs or take the lift to reach the public areas and master suite. Straight ahead at the top of the stairs, is the master suite and a small study. 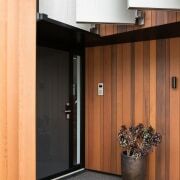 The latter achieves privacy from the street thanks to the fixed external fins on the front of the home. The generous-sized, private master suite is separated from the living spaces by a deck that cuts into the floor plan, dividing the two areas. The outdoor living areas further extend the size of the living spaces in this home by Boon Team Architects. 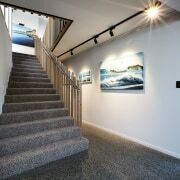 To the left at top of the stairs is the approach to the open-plan living zone at the other end of the home. A long, faceted wood cabinet creates interest in this through area. The light-filled, living-dining-kitchen space is the star of the home. 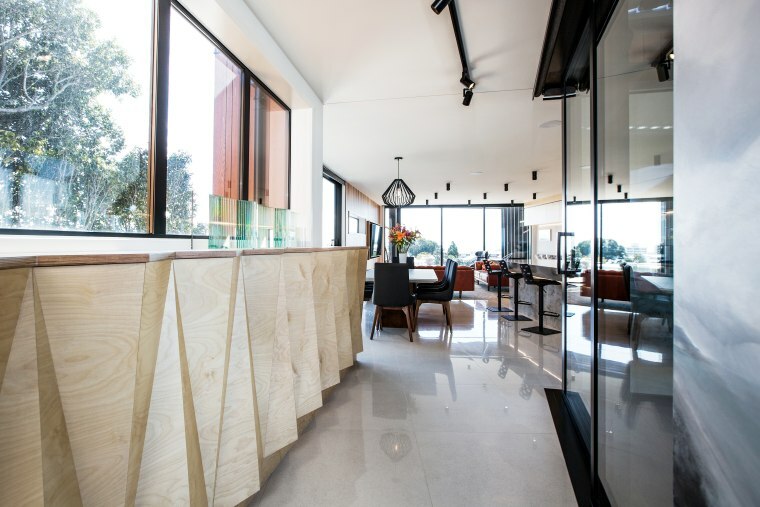 The kitchen has a marble island with a bevelled benchtop that provides for casual seating, while the rear cabinetry extends the use of plywood. A window splashback throws natural light onto kitchen worksurfaces. Most arresting, though, are the room’s many links to the outdoors. 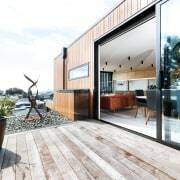 Decks reach out to views to the north, east and west – so there’s always a sheltered spot despite Taranaki’s changeable weather. Plus, the deck that tucks in between the master suite and living zone has roof louvres, effectively creating an outdoor living room. 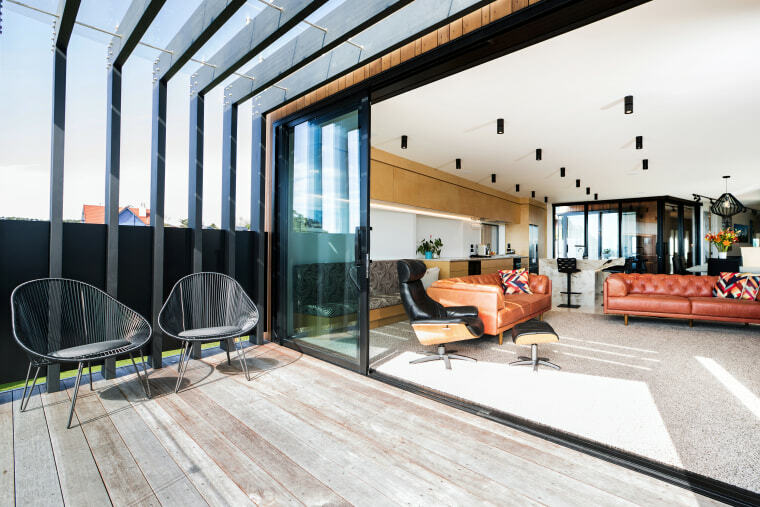 The north deck also has an angled black steel pergola that adds further architectural interest. 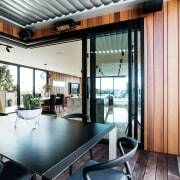 With all the stacker doors drawn wide open, the interiors and deck spaces merge to create an expansive indoor-outdoor living environment.